We offer spacious bridal and groom suites on-site so your entire bridal party can relax and get ready before the festivities commence. The Bridal/Groom suites are just absolutely amazing and will allow you to de-stress for your special event. The stylish, modern Board Room has full A/V capabilities can accommodate up to 12-15 guests and is perfect for private meetings or seminars. The stunning panoramic view makes it a great meeting space to meet with your exclusive clients. The Garden Oaks Room is a perfect location for evening events from 30-80 guests and has a stunning view of the Golf Course. Whether a Corporate event, Rehearsal Dinner or an Intimate Wedding Reception, the Garden Oaks Room creates an air of prestige, elegance and privacy. We can accommodate from 150--320 guests in our elegant Oaks Ballroom located in this picturesque venue. It features a spacious, open layout that can be customized as you see fit. It has an elegant, modern décor, a full stage, dance floor, and audio visual capabilities. The Oaks Ballroom is professionally designed and traditionally decorated for all occasions. From toasting a wedding, or to chairing a corporate meeting in one of the private rooms, Oaks Ballroom has the perfect accommodations and excellent cuisine for everyone. 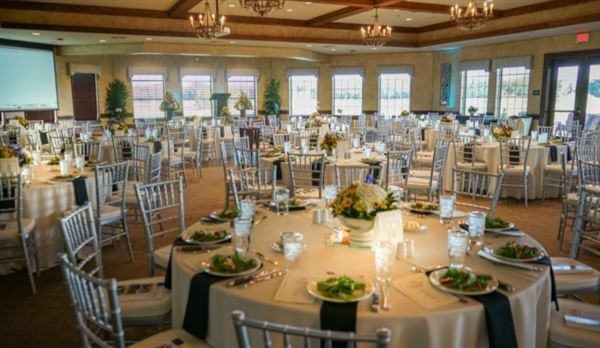 The East Ballroom features a panoramic view of the Southern Oaks Golf Course and features a full stage, dance floor and seating for 100-150 guests. The West Ballroom features view of the Patio and the Golf Course and is perfect for smaller events for 70-120 guests. You can exchange your vows or have a party in our gorgeous patio with a spectacular backdrop of rolling hills and open spaces. The outdoor patio boast 2 beautiful Texas limestone fireplaces facing the manicured Golf course.